The Dragon and the…First Man? Good news, Game of Thrones fans: Filming for the eighth and FINAL season has officially started. And while I'll probably have a million and one questions when 2018–19 rolls around, I have one very urgent question right now: WHY IS RHAEGAR TARGARYEN HANGING OUT WITH THE NIGHT KING? Just yesterday (Oct. 22), actor Wilf Scolding, who played Rhaegar in Season 7, shared this photo of himself with actor Vladimir Furdik, who has played the Night King since Season 6. Because it SEEMS like this wasn't just an "Oh, hey! Let's take a quick photo for Insta" kinda thing. I mean, they had lunch together, which usually entails a lot more getting-to-know-you kind of talking. Perhaps they were discussing a SCENE they'll be in together?! Of course, it's pretty unlikely that these two will have a scene together in Season 8...I think. 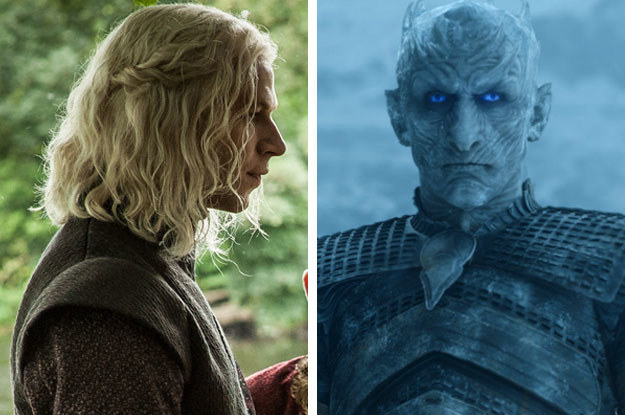 At one point, some fans even thought maybe Rhaegar IS the Night King, but that wouldn't really make sense since a) we know two different actors play these roles and b) the Night King was created by the Children of the Forest, i.e., long before Rhaegar's time. Obviously, we'll be seeing a lot more of the Night King in the final season, so assuming Vladimir is in Belfast now for filming...and Wilf is there too...does this mean we'll be seeing a lot more of Rhaegar next season, too? Like, will we finally get to see a flashback of Robert's Rebellion?